One of the goals in object-oriented design is to delegate responsibility among different objects. This kind of distribution is good as it reflects two important features in object oriented methodology, encapsulation and delegation. Often, we find ourselves in one of the following situations that needs a solution. An application (or framework) at runtime, is incapable of anticipating the class of object/instance. The application may know that it has to instantiate classes, but it only knows about abstract classes (or interfaces) that cannot instantiate. PROBLEM: The Application class only knows when it has to instantiate a new Object of an abstract class, but not the specific type of subclass. A superclass may require its subclasses to specify the Objects to be created at the creation time. A class may delegate responsibility to one of several assisting subclasses so that services can be distributed locally to specific subclasses. The solution to the previous problem is a creational pattern, namely Factory Method. A design pattern is a description or template for how to solve a problem that can be used in many different situations. The Factory Method contains an interface which lets the subclasses decide at creation time which subclass to instantiate. This pattern is named as a factory as it is responsible for manufacturing an Object. A factory does not make an Object. To make a new Object, we make a simple call to new. (Read “Java Review: Instantiation w/ the Keyword New”. However, the Factory pattern promotes loose coupling by eliminating the need to bind application-specific classes into the code. The use of factories in the code facilitates delegation of specific attributes of an object into specific subclasses. Therefore, the Factory pattern helps make a system independent of how objects are created. The example is based on Java. In this example, upon receiving the user choice of geometric shape, either Circle or Rectangle, the factory interface will defer the instantiation to the associated subclass. The following class diagram shows the structure of the classes and interface. Their signatures are displayed in the following. ShapeProcessor is a factory interface, only containing a group of related methods with empty bodies. Shape contains the common properties and operations that are shared among its subclasses, Circle and Rectangle. Circle extends Shape to inherit all the members from Shape, and implements ShapeProcessor for its abstract methods. 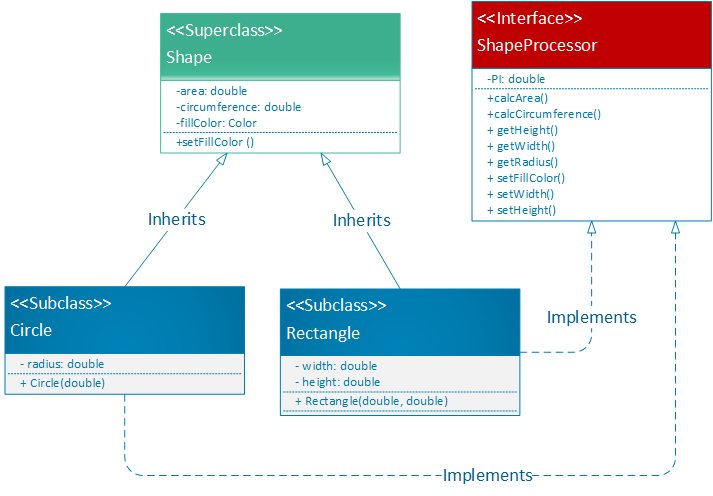 Rectangle extends Shape to inherit all the members from Shape, and implements ShapeProcessor for its abstract methods. A factory interface only contains a group of related methods with empty bodies. An interface method is separate from its implementation. The subclasses will be responsible for implementing the interfaces. Both classes and interfaces can be organized into a package (a namespace). The following is an implementation of the Factory interface ShapeProcessor by using the keyword interface. Noticeably, the interface class can also contain the constants. With the class structure in the example, we can declare new objects and instantiate them in an Application class (Main Class) in the main method. Declare a new object of the Factory Interface type. Instantiate the new object by calling the constructor of the required subclass. An example is given below for a sample main method. The sample code is provided to help you understand the Factory method, in the following five class files.